Today’s recipe is all about left-overs. What do you do when you have about two cups of left-over hot beef?? 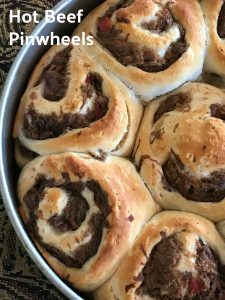 You make Hot Beef Pinwheels! 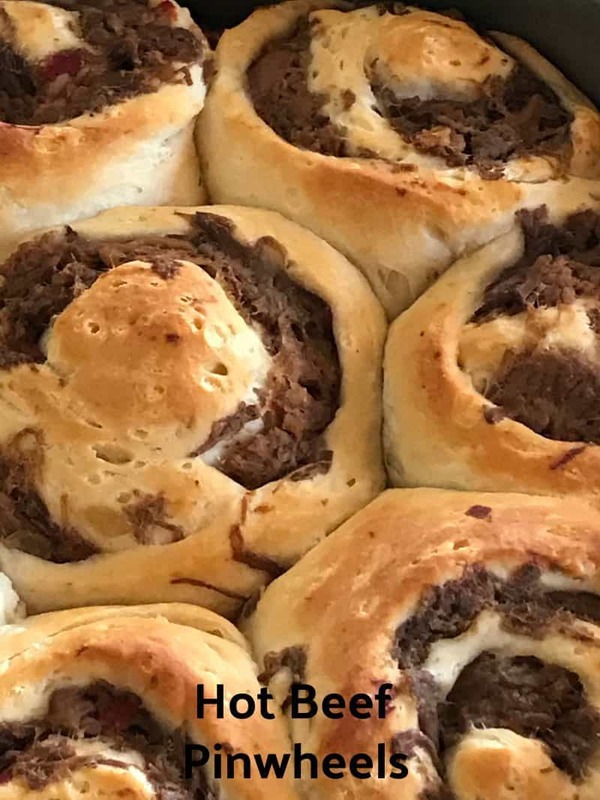 First let me explain what “hot beef” is. In my family, we call “shredded” beef, “hot” beef. 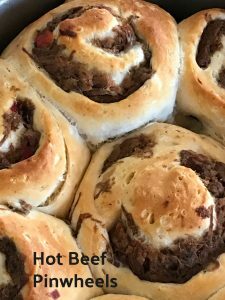 “Shredded” beef or “hot” beef is served on a bun or my personal favorite, a nice “roll.” I prefer a nice “roll” that is crusty on the outside and tender on the inside…better to soak up all that flavorful juice. Besides serving their legendary pizza and garlic bread, Frank’s serves The Best “hot beef” sandwiches around. If you grew up in Appleton or the surrounding Fox Valley area, chances are you have at least once in your life eaten at the Pizza Palace…if you haven’t, shame on you. You don’t know what your missing! I have many memories of spending time at Frank’s Pizza Palace. This led to the creation of horseradish sauces which can spark the flavors of many meats, fish and vegetables. 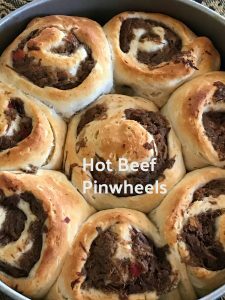 You can serve these yummy hot beef pinwheels with horseradish, horseradish sauce or the warmed juice from the drained hot beef. Check out this recipe for Homemade Horseradish. This ancient herb, (one of five bitter herbs of the Jewish Passover festival) is a native of eastern Europe but now grows in other parts of Europe as well as the United States. Though it has spiky green leaves that can be used in salads, horseradish is grown mainly for its large, white, pungently spicy roots. Choose roots that are firm and no sign of blemishes or withering. Horseradish should be refrigerated, wrapped in a plastic bag, and peeled before using. It’s most often grated and used in sauces or as a condiment with fish or meat. Bottled horseradish is available white (preserved in vinegar), and red (in beet juice). Also available is dried horseradish, which must be reconstituted before using. Wasabi; wasabe [WAH-sah-bee] This Japanese version of horseradish comes from the root of an Asian plant. It’s used to make a green-colored condiment that has a sharp, pungent, fiery flavor. Wasabi, which is also called Japanese Horseradish, is available in both paste and powder form in specialty and Asian markets as well as in supermarkets. A great way to use left-overs. In a large Dutch oven, place beef roast, chopped onions, chopped green chilies, butter, onion soup mix, black pepper and enough water or beef broth to cover roast. Cover Dutch oven tightly. Bake in a 350 degree oven for 2 to 4 hours and roast is fork tender. Remove roast, cool. Shred meat using 2 forks. Skim fat from liquid in Dutch oven and discard. Stir shredded beef back into liquid. Add coarsely chopped red pepper strips and simmer beef mixture on top of stove, over medium heat, until liquid has reduced by almost half. Flatten biscuits out on a lightly floured surface. Using a rolling pin, roll out rolls to roughly a 10 x 16 rectangle. *The rolls won't be perfectly straight and don't roll to thin or the biscuits will tear. 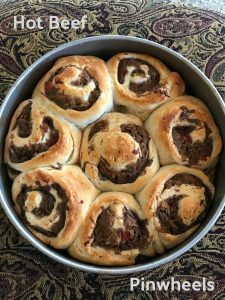 Spoon cooled and well-drained beef over the biscuit dough. Fold in sides and carefully roll up. Slice into 6 to 8 rounds and place rounds into prepared pan. Press rolls down lightly with fingers to flatten them slightly. 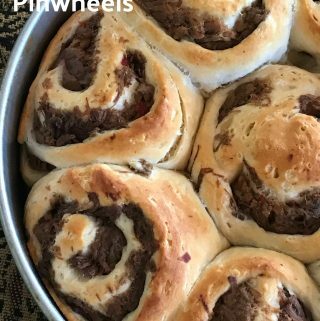 Bake at 350 degrees for 20 to 30 minutes or until rolls are a nice golden brown. 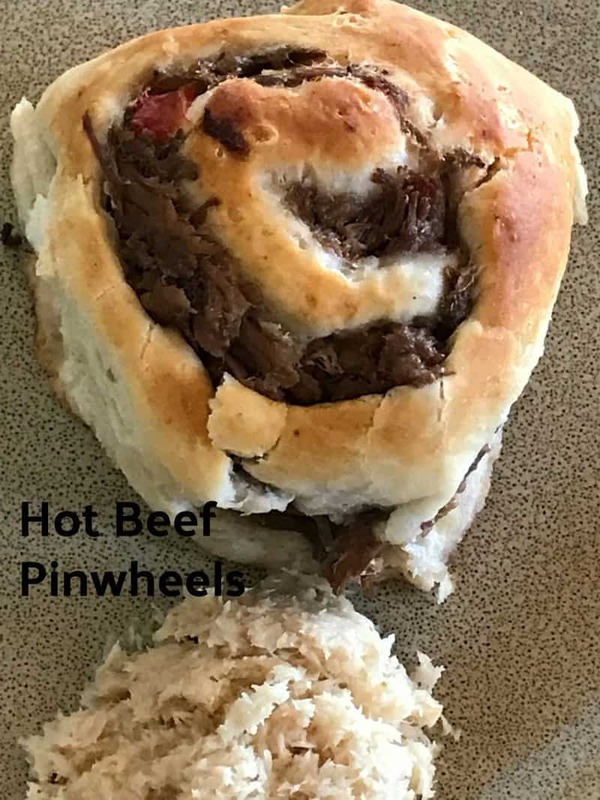 Serve with horseradish, horseradish sauce or warmed juice from beef.